Primley View is registered to provide accommodation for persons who require nursing or personal care. Services are provided for people who have dementia. Offers a laundry collection and delivery service for people who are elderly or infirm. Also offers service washes. Area served: Torquay, including Babbacombe and St. Marychurch, and edge of Paignton, including Marldon and Compton. Butcher – fresh meat. Can also offer fresh and frozen fish to order. Shop is wheelchair accessible. General grocery shop supplying tinned goods, milk, bread, vegetables, frozen foods, dairy foods, delicatessen, household goods, sweets, chocolates, and off-licence. Launderette with self-service, service washes, dry and fold, home collection and delivery service. Dry cleaning agent. Rug or carpet cleaner rental. Area served: Paignton and Marldon. Harbour Rise is a rest home for the elderly, situated in one of the prime positions in Torbay with panoramic views over the bay from the lounges and many of the bedrooms. The picturesque Paignton harbour, shops and Goodrington Sands are a short walk away. Launderette with self-service, service washes, dry cleaning and home collection and delivery service. Ocean View (formerly Las Flores) is a care home without nursing that is registered to provide accommodation and personal care for up to 25 older people who may have mental health issues. Summon Bonum is a care home which cares for up to nine people with learning disabilities and other complex needs. Care home without nursing run by Renaissance Care Services Ltd. The home has 17 beds and provides support for adults (18+) with learning disabilities. Operates on a home visit basis only. 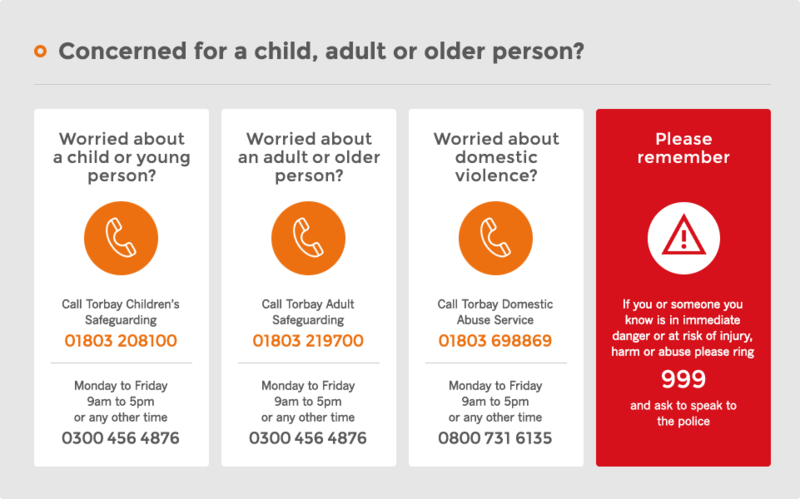 Home visits in Torbay and beyond (generally not outside of Devon). General Groceries and off-licence. Delivery and telephone shopping service for all groceries, some green groceries, meat and poultry, delicatessen products, wines, beers and spirits. Provides personal care, complex and continuing care, supported living, social care and domestic services to adults, children and young people. Area served: Devon, Cornwall and Somerset. Sesame is a small home for young adults with complex learning disabilities. It offers a safe environment, enabling residents to explore their potential and develop their level of independence with help from caring and skilled support staff. Quintaville is a care home, registered to provide accommodation and care for up to 20 people. People living at the home have a variety of needs. Some are older people, some have a learning disability or need mental health support. Jubilee House is registered to provide accommodation for up to 28 people who require nursing or personal care. People using the service are older people, some of whom have memory problems or dementia. The home is run by A D L plc. Carisbrooke Nursing Home is registered to provide care and nursing to 25 people who have needs related to old age, including physical disabilities. Woodrow retirement home is a care home without nursing registered to provide accommodation and care for up to 16 older people. General stores/off-licence – free delivery of groceries, fresh foods, fruit/veg, tinned goods, off-licence, newspapers and magazines. Area: immediate area, including Barton and St Marychurch. Care home without nursing, run by Parkview Society, that provides care and support to one person with a learning disability. Choice Care Home is registered to provide accommodation and personal care for up to 24 older people who may have a physical disability or suffer from a dementia type illness. The home is run by Rosepost Healthcare Ltd.
Mears Care Torbay provides care and support to people in Torbay and Southern Devon who wish to live independently in their own homes.